To London, and specifically Waterloo, where my wife and I treated ourselves to two tickets to York Theatre Royal's production of The Railway Children. It's a brilliant, imaginative staging, anchored by Marcus Brigstock's excellent Perks, which we enjoyed tremendously. For me, though, it goes much further than merely "enjoying". The story's emotional hooks are so deeply embedded in me that I am powerless not to be swept along, guaranteed to be reduced to tears on at least two occasions. I suspect that the significance of The Railway Children is very much a British thing, and probably a generational thing as well, but perhaps its reach is wider than that. The 1970 film, starring Jenny Agutter, is by far the best known version of the story beyond Edith Nesbit's 1906 book. In the UK at least, it's been a staple of television repeats for many years - Christmas, bank holidays, sunday afternoons. I must have seen it dozens of times before I acquired a DVD copy. There had been three previous television adaptations before Lionel Jeffries' film, of which the 1968 production also features Agutter - but I've never seen any of them. As for the 1970 version, I've no recollection of seeing it earlier than about the age of eleven or twelve, and perhaps even older than that. The youthful Bernard Cribbins, who takes the role of Perks the stationmaster in that film, has of course featured in recent episodes of Doctor Who as the grandfather of the Donna Noble character. The 1970 version will always be the definitive screen adaptation for me, but I've also grown very fond of the TV film from 2000. In a nice touch, Jenny Agutter returns, but this time as the mother of the children. Gregor Fisher supplies an enjoyable Perks. As a child it was the train sequences that endeared the film to me, and of course the romance of railways and railway travel is an inescapable element of the story, ably captured in the York Theatre Royal production. More than that, though, what gets me every time is Bobby's reunion with her father, returned from false imprisonment after being wrongly accused of treason. The dramatisation of that moment in the 1970 film, as the smoke clears and Jenny Agutter at last sees the reason she has been called to the station, is very possibly my favorite moment in cinema. And if that makes me a big crybaby, so be it. Not a clip from the film, but a link to a YouTube song by the splendid and much-missed Kitchens of Distinction. Softly softly comes the train into the station. She has often waited and wondered if he'll come. Why was he kept away then, held from coming home now? Was it troubled loyalty or a brand new family? 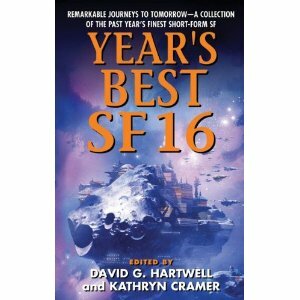 I can't find a good image of the cover, but the Twenty Eighth Annual Edition of the Year's Best Science Fiction, edited by Gardner Dozois, is now out in the States. It contains my long story from "The Mammoth Book of the End of the World", "Sleepover". Sleepover attracted almost zero attention upon its original publication (I know, moan moan moan), so I'm very grateful to Gardner for picking it for reprinting. As always, it's a blast to see my name inside the Year's Best, let alone on the cover. They brought Gaunt out of hibernation on a blustery day in early spring. He came to consciousness in a steel-framed bed in a grey-walled room that had the economical look of something assembled in a hurry from prefabricated parts. Two people were standing at the foot of the bed, looking only moderately interested in his plight. One of them was a man, cradling a bowl of something and spooning quantities of it into his mouth, as if he was eating his breakfast on the run. He had cropped white hair and the leathery complexion of someone who spent a lot of time outside. Next to him was a woman with longer hair, greying rather than white, and with much darker skin. Like the man she was wiry of build and dressed in crumpled grey overalls, with a heavy equipment belt dangling from her hips. Gaunt squinted against the brightness of the room’s lighting, momentarily adrift from his memories. ‘Where am I?’ he asked. His voice came out raw, as if he had been in a loud bar the night before. He grasped for memories, something specific to hold onto. Green-gowned doctors in a clean surgical theatre, his hand signing the last of the release forms before they plumbed him into the machines. The drugs flooding his system, the utter absence of sadness or longing as he bid farewell to the old world, with all its vague disappointments. I'm in the late stages of what will probably be the last substantial draft of BLUE REMEMBERED EARTH, mindful that while there will still be chances to make some minor changes further down the line, this is really the last opportunity to inflict major adjustments on the story. Along with detailed editorial feedback, I've also been fortunate enough to have responses from some "beta-test" readers who were generous enough with their time to take a look at the May draft. As always, emotions are mixed - these readers will inevitably pick up on plot holes and inconsistencies that you'd either thought were resolved or were not aware of at all, but at the same time it's encouraging to see that someone else is able to track through the plot from A to B to C and pick up on nuances that make it clear that they understood not only the surface currents of the story, but the implied mechanics of the invented world and its characters. That, in other words, they weren't completely bewildered and lost by chapter three. The hard part is sifting through those reader responses and deciding which you act on, and which you discard. Assuming, of course, that you can reconcile two or more sets of reactions which may not readily dovetail. A book at this stage is essentially a done deal - a production slot is assigned, artwork commissioned, buyers (hopefully) persuaded of its worth. If a reader tells you that the motivation of character X in chapter Y needs a bit of tweaking, you can deal with that. If that same reader suggests that the entire premise of the novel is flawed, that the only possible course of action is a total rewrite or even abandonment, you have no real option but to discard their advice. That's never happened to me yet, but it's always a possibility. Writers are artists, but publishing is a commercial enterprise with schedules and expectations. The momentum may not be as unstoppable as that which governs the shooting and cutting of blockbuster films, assigned a tentpole release date a summer or two ahead which absolutely must be met, at all costs. But it's still momentum, all the same. "I've flown on two shuttles and they both felt a little bit different. They are real ships with their individual characters and their own nicks and bumps. You look at the shuttle, it's not as if it's this pristine, shining, gleaming piece of metallic technology – it looks like a ship, it's got dents and burns and inside multiple crews have whacked the paintwork and you can see scratches and things. They are ships that have been operated and lived in and done these incredible voyages all with their individual characters. I am personally very fond of the shuttle. When they wind up in museums I'll go and see them and I'll be happy to see them like old friends." 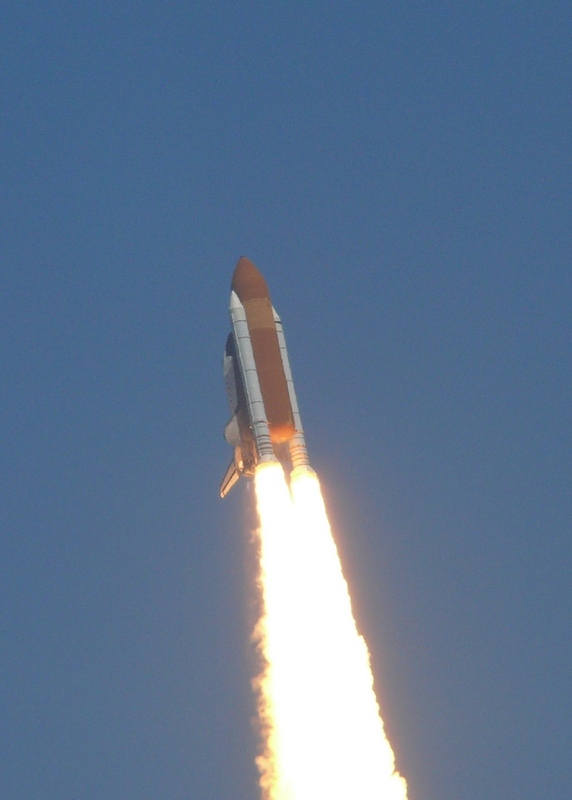 Thanks to Piers I was able to observe the launch of STS-132 last year, a truly memorable experience. A year earlier I also witnessed (thanks to my friend Louise Kleba) the launch of STS-125, which was another Atlantis mission and one commanded by Scott Altman. As documented at the time, I managed to lose my camera hours after the launch but fortunately that didn't happen with STS-132. This is part of a general profile-raising campaign ahead of Blue Remembered Earth's release in January, but hopefully I'll enjoy it well enough to stick with afterwards. Features my story "At Budokan", about the future of rock promotion and death metal, which originally appeared in the SHINE anthology. I am very grateful to David and Kathryn for reprinting it, and to Jetse de Vries for buying it originally. I spent last weekend in Derby, attending the excellent Alt.Fiction, a slickly run and enjoyable cross-genre event with a nice mixture of SF, fantasy, crime and horror writers (and readers) present. As much a workshop as a convention in the usual sense, it was terrifically good fun and well situated in the heart of Derby, within easy range of restaurants and reasonably priced hotels. My thanks to Alex Davies for the invitation, and to the other guests and attendees for making everything so pleasant. This is the European Science Fiction Society Hall of Fame award for best writer, and I'm delighted to be the recipient in 2011, following on from my colleague and friend Stephen Baxter last year. When Cheryl emailed me from Stockholm to say the award was mine, I was doubly delighted because I hadn't even realised I was up for it. It's the kind of thing that makes you want to rub your hands and say "excellent" in a Mr Burns style. 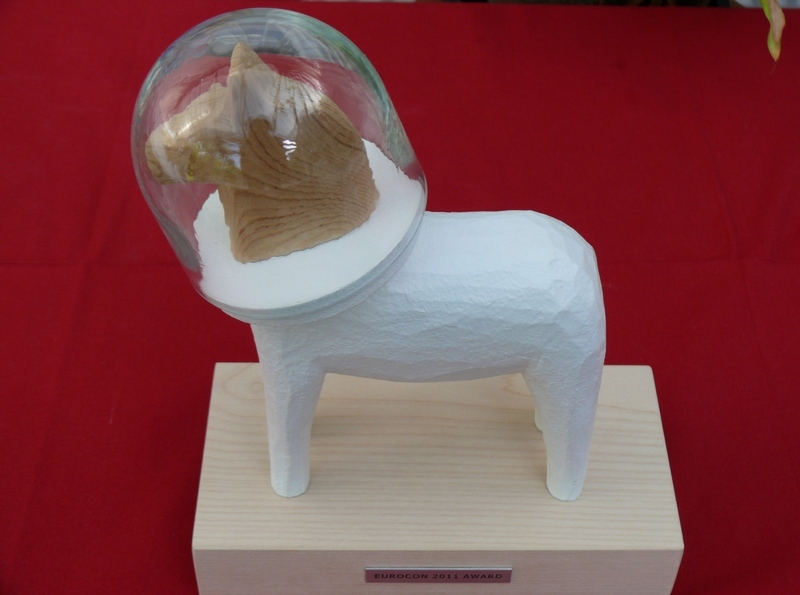 The significance of the pony is that these wooden statuettes are a Stockholm speciality; mine has been transmogrified with a spacesuit and helmet. I understand that the other awards given out that night were similarly wacky. I am immensely grateful to the ESFS for the award, to Cheryl for bringing it home, and to the organisers, guests and attendees of Alt.Fiction for an excellent time.